Good condition Napoleonic Wars period British army flank officer's sabre and scabbard. 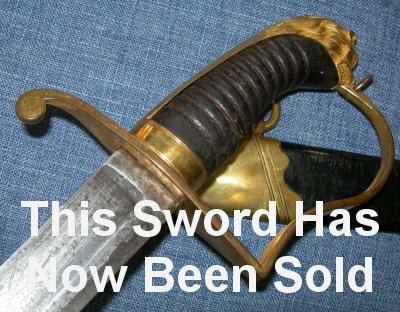 Many swords are often wrongly described or even portrayed as British flank officer's sabres; this is 100% authentic. Flank officers fought along the sides of the main army column. They were highly mobile riflemen / grenadiers who used their swords as a weapon of last choice in close combat. As such they had a preference for shorter more agile slashing sabres similar but shorter to cavalry sabres. Unfortunately many short (yeomanry, child's and practice) sabres get presented as flank officer swords when they are not. 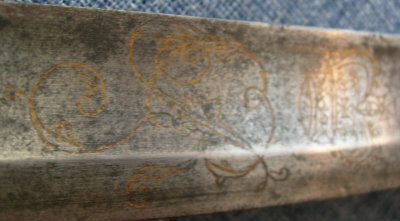 This fine sabre with its lion's head pommel, Georgian royal cypher and infantry style etchings guarantees it is. The curved 26 3/4 inch blade (last millimeter of the tip missing; hardly noticeable) is firm in the hilt. 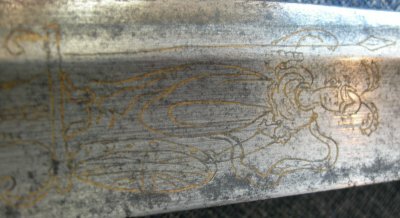 The hilt having retained significant gilt, the leather grip with a few small worm holes (testifies it is original) and all of its ring bindings (grip wire) in good shape. 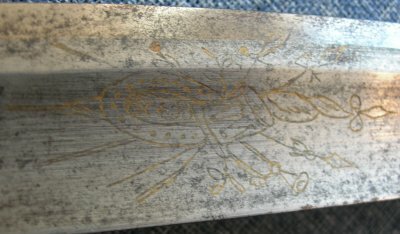 The sword sheathes well in its original scabbard. The scabbard leather in very good order considering its age. Further / full sized pictures available upon request. Item reference code 309.